The International Journal of Human-Computer Interaction is honoring ISR-affiliated Professor Ben Shneiderman (CS) by dedicating a special issue in honor of Shneiderman's 60th birthday. 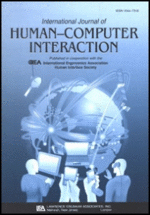 "Reflections on Human-Computer Interaction" features articles by Shneiderman's colleagues and former students, as well as others in the field of human-computer interaction. For a limited time the content of the journal is accessable free of charge.